Pls bear with the photo as it is from my BB, my camera is back on Monday. Chop into small pieces babycorn, onion, curry leaves coriander and green chilli. Put in a bowl. Now add rest of the ingredients and mix with little water. The mix should not be too thin nor too thick. Heat oil in kadai, take about a tspn of the mix and drop them in oil and deep fry both sides. Yes Prathibha you can try Golden fried babycorn for that. Thank you. Thank you Hari, Tina, Jeyasri and Priya for your comments. wow very tempting and yummy !! 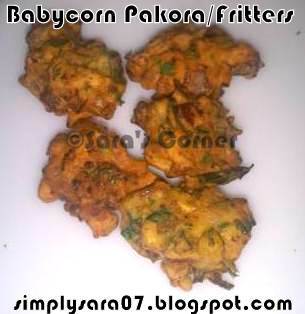 pakodas look delicious,never tried this way,..
Looks really delicious crispy and delectable. Soo tempting fritters, feel like munching some..